As a writer, I try to be observant. Write what I see, describing with just enough detail that the reader sees what the characters see. Sometimes the scenes fly to me—especially on Fripp Island. One afternoon, I was sitting in my favorite chair chatting on the phone when I heard something outside. Since my family room is three stories up, I was more than a little curious about my visitor. And luckily my camera was not far from my chair. This Great Blue Heron stopped to admire my view. Well, hello world! Have you noticed that my novels are all based near the sea? One day, I may dare to write a landlocked novel, but not just yet. I love the sea and I spend a lot of time hanging out with my characters in their settings. I’m working on the sequels to Shades of Gray. These two romantic suspense novels have to be written. Abby and Maggie deserve their Happily Ever After, don’t they? Abby’s story takes place in Savannah, Georgia, and Maggie is back on that small island off the coast of South Carolina where you first met Sam. I do find myself distracted from writing as a walk with my camera, but it does keep my imagination moving forward and I get to post a photo every now and then. Since writing The Ex Lottery, I’m a little obsessed with all things Irish, but I was surprised when I started looking up Halloween stories that might interest my readers. Did you know that by some accounts the tradition of carving a jack-o’-lantern on Halloween originated in Ireland? The Irish carved grotesque faces into turnips and beets. Our neighborhood sticks to carving pumpkins, but those pumpkins greet an amazing number of Irish descendants. The Irish Travelers live just outside my town’s city limits in Murphy’s Village. They spare no expense dressing their children for this special night. So tonight, I’ll be sitting on a neighborhood porch with friends handing out thousands of pieces of candy treats to the long lines of goblins, princes, and super heroes. The Wonderful World of “What If?” On a daily basis, I see something or hear a portion of a conversation and my mind takes off to the Wonderful World of “What If?” I wrote my latest novel, “The Ex Lottery” after just such a “What-If?” moment. My imaginary world happens to involve lots of love, fairy tales, and happily ever afters. Join me Friday on October 10th at the website Everybody Needs A Little Romance and we can discuss whether or not you ever experience such “What-If?” moments. Best-selling romantic suspense author Donnell Ann Bell honored me with the request to write a short blog for the website Everybody Needs A Little Romance then to stick around and answer your questions. Can’t wait to hear those questions. And you’ll love the website. It’s a romance readers road map to great fiction. When you visit, check out The Romantics, they are all award winning authors who are the primary bloggers on the site. A treasure map to romance. See you in the virtual blogging world on Friday. The reviews are in—well, one important review. Kirkus Reviews reviewed my second novel, The Ex Lottery, and selected the contemporary romance as Today’s Featured Indie Book Review on the website www.kirkusreviews.com. For those of you who are not familiar with Kirkus Reviews, you may not understand my excitement. Kirkus Reviews has a reputation for honesty and integrity that dates back 80 years. Virginia Kirkus was a woman ahead of her time. She started the business during the Great Depression. She was told she would fail, but she created a fabulous business that succeeded against all odds. Sounds like a heroine in a romance novel, doesn’t she? For the complete history of Kirkus Reviews, check out the website. Or if you just want an honest review on a book, go to the website. I always read the company’s reviews of current bestsellers and then I flip to the list of romance novel reviews. If you have a chance, check out the review of my novel at https://www.kirkusreviews.com/book-reviews/kim-sanders/the-ex-lottery/ and if you need a fun beach read, you can actually read my book for free on AmazonPrime. I’d love to read your review too. I love the Low Country beaches of South Carolina. There is just something about the salt air and the sound of the surf that makes me happy. When I develop writer’s block, I hop in the car and drive non-stop to the beach. My car is like a horse headed to the barn when I point it east. My husband often says that the beach heals me. What can I say? The beach is my heaven on earth. The tingle of dried sea salt on my skin, warm sand beneath my toes, and a splash of Coppertone to mingle with the ocean breeze. Heaven. A simple walk on the beach and I’m writing again. Have you ever wondered how an author comes up with story ideas? For me it’s a simple observation. I see or hear something, and a tale begins spinning in my head. What if? I love that question. I was sitting on my porch trying to plot my next romantic suspense and feeling stuck. 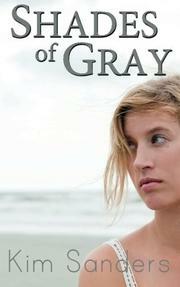 I knew I needed to write a sequel to Shades of Gray. I love writing suspense. But I was distracted. I reached for one of my reference books and noticed I’d used a losing lottery ticket as a bookmark – I believe in recycling. Studying the ticket, I thought about a conversation I’d had with my daughter the previous night. She was giving up on men – dogs were more reliable. She was buying her own home and returning for a second graduate degree. What if? I stared at the lottery ticket and wondered what her life would be like if she won the millions for a dollar investment. And The Ex Lottery was created. I’m happy to say the book itself has nothing to do with her life, but I thank her for her frustration that day because it sparked my imagination. Enter to win a free, signed copy of The Ex Lottery on Goodreads! 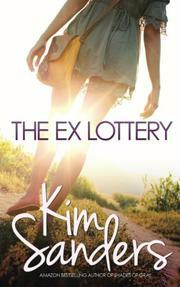 I’m giving away ten signed copies of The Ex Lottery on Goodreads during the month of June. Good Luck! The Ex Lottery is now available for your Kindle or in paperback. THREE EX-BOYFRIENDS, ONE GORGEOUS IRISHMAN, AND A CASTLE. From the author of “Shades of Gray” comes the story of a lonely art teacher who is unlucky in love but lucky in numbers. In Kim Sanders’ new contemporary romance, “The Ex Lottery,” art teacher Tory Adams has loved three times—and been dumped three times. On a whim, she buys a lottery ticket using the dates her ex-boyfriends dumped her. And wins. With her newfound pot of gold, Tory travels to Ireland determined to buy a new home and a new beginning. Growing up, Tory listened to her grandmother spin magical tales of an Irish castle on Dragon’s Isle. Tory decides to buy in that very castle. But with money, comes complications and a new chance at love. Tory soon finds romance at every turn. First, a handsome Irishman appears followed by a trio of men all vying for her love. All Tory has ever wanted is love, home, and family. But now she must decide—do the men love her or are they simply romancing the numbers? In June, I was honored by being featured on the cover of the South Carolina magazine Life on the Riverfront. My home in North Augusta borders the Savannah River. The city has created nature trails along the river and through beautiful woodland areas. It’s a wonderful place for combining exercise with creativity.